The following outlines submitting a support / trouble ticket and contacting our team. We look forward to working with you while providing top flight IT Support. This is the best option as it immediately creates a ticket number, associates the ticket with your customer account, location, and computer. Find the the ACE Management Agent icon located in your task tray (bottom right of your screen by the Date / Time). If you do not see the ACE Agent displayed you should see to display hidden icons. This can be customized to always display the ACE agent icon. *If you see a Red Circle with a line thru the ACE agent this means your PC is offline probably due to no Internet connectivity. In this case you will most likely need to call. Click on the ACE Agent icon for a menu of options. 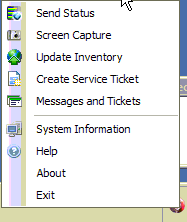 Select “Create Service Ticket” to launch the new service ticket dialog. Fill out the service ticket. From: enter your work email address or your name if you don’t have one. In the large text box, enter a more detailed description of your issue. It’s also helpful to enter the BEST number to reach you – like your CELL PHONE or BACK LINE number. This is particularly helpful if you call early/late when your regular office phone number is on service. If you have an error on your screen it is often helpful to send a screen shot. To attach a screenshot, click the Attach Screenshot button. The Create Service Ticket window will automatically minimize, take screenshot, and maximize the window. If the Create Service Ticket window doesn’t automatically maximize, click on the ACE tile in your running applications of your Task Bar (usually at the bottom of your screen). **NOTE: If you have multiple screens, only the main screen is captured. The main screen is the one with the start button. If possible, move any error dialogs to the main screen before capturing the screen. You can set the Priority with the Importance button . Options are Low, Normal, High and Emergency. Normal is the default importance. Please only use Emergency for TRUE emergencies. If your ticket is an after-hours emergency, follow up with a call to our after-hours emergency phone line. Click Send and your ticket will be submitted along with your screenshot. Click Cancel if you do not wish to submit the ticket or screenshot. IMPORTANT: IF YOU HAVE AN AFTER HOURS EMERGENCY, ALWAYS FOLLOW UP WITH A PHONE CALL AND LEAVE A MESSAGE ON THE EMERGENCY LINE. INCLUDE YOUR SERVICE TICKET NUMBER IN YOUR MESSAGE. 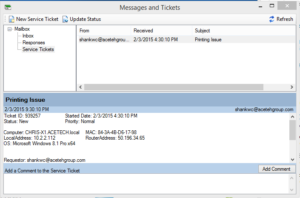 Sending an email to support@acetechgroup.com will automatically create a service ticket as well. Our ticketing system has an automatic parser that tries to match the email sender address to a specific customer and create a ticket. If your email address hasn’t been registered in our system, it may not place your support ticket with the incorrect customer account. So prefer that you use the ACE Agent on your PC whenever possible. If you get voicemail, your message will be sent to the Help Desk team immediately. When you speak with the support technician, ask them for your Ticket Number. This will allow you to track the progress of your ticket. Be sure to tell the technician which PC is affected so that they can associate the ticket with that PC, which will allow you to better track the ticket progress. Our normal Help Desk phone support hours are 8:30am-5pm, M-F. If you call with an issue outside of these hours you will reach the “after hours” system and will be able to leave one of two types of messages (normal or emergency priority). 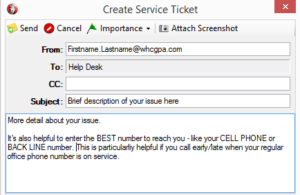 If possible, try to create a Service Ticket from your PC first and include the ticket number in your message. Press #2: Leave a standard message which will be addressed during the next business hours. 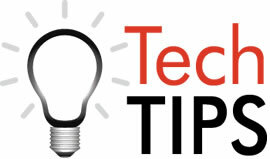 Press #3: Your message will also initiate an Emergency Page to the on-call support technician. If you submitted your ticket from the ACE Agent, then the ticket is already associated with your PC. Click on the ACE Agent to open the menu. From the Messaging and Tickets window you can see Service Tickets, check their status and even add comments. Be sure to click Refresh and/or Update Status to see the latest information about your tickets.